GET YOUR TICKETS FOR YARCS's Aladdin (Dual Language Edition) here !!! 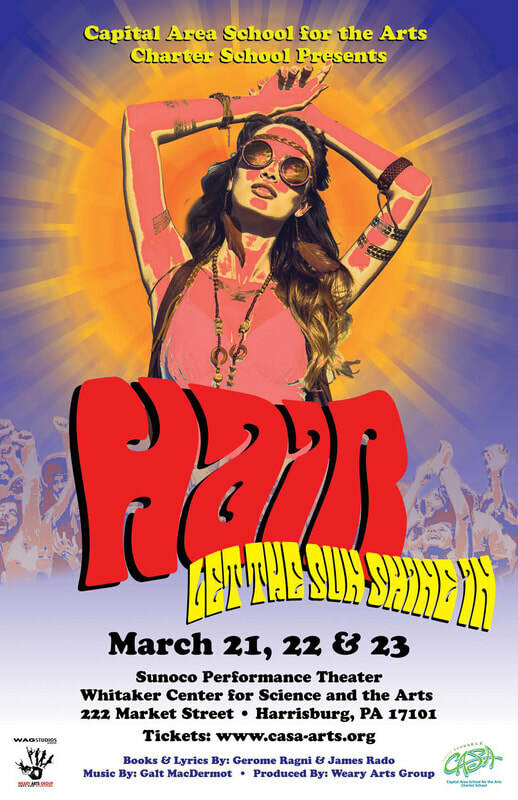 Hair: The American Tribal Love-Rock Musical follows a young group of hippies fighting the establishment, dodging the drafts, getting high, living and loving in New York City. It’s 1967: the Vietnam War raging and the Age of Aquarius is dawning. Claude, his best friend Berger, their roommate Sheila, and their Tribe of friends struggle to balance the demands of the harsh and violent world with their dream for a more beautiful and peaceful world. When Claude receives his draft notice, he must decide whether to join his friends in resisting the draft, or bow to the pressures of society and his conservative parents, thereby sacrificing his ideals and, possibly, his life. Hair was a sensation when it premiered in 1967, as it brought the counterculture movement into the theatre and the national spotlight. The issues the show brings up -- alienation, civil disobedience, youthful defiance -- continue to timelessly resonate today. In the Heights centers on a variety of characters living in the neighborhood of Washington Heights, on the northern tip of Manhattan. At the center of the show is Usnavi, a bodega owner who looks after the aging Cuban lady next door, pines for the gorgeous girl working in the neighboring beauty salon and dreams of winning the lottery and escaping to the shores of his native Dominican Republic. Meanwhile, Nina, a childhood friend of Usnavi’s, has returned to the neighborhood from her first year at college with surprising news for her parents, who have spent their life savings on building a better life for their daughter. Ultimately, Usnavi and the residents of the close-knit neighborhood get a dose of what it means to be home. ​Scarlet O’Hara never had it so good — because two scam artists are about to bring Disco to Dixie. Designed to out-produce The Producers, Totally Gone with the Wind is the story of two loveable scoundrels who set out to create a Broadway flop by turning an American literary classic into a 1970s musical disaster. Don’t miss the fun, as our two low-lifes commission, audition and cast a show designed to bring the audience to their feet and send them right out the door. If our producers can close the show on the first night, they can take the investors’ money and run. It seems like a fool-proof plan, especially when the actor playing Scarlet turns out to be a man.